Kealie Scheffler, Ashtyn Krohn, Clay Sandman and Myranda Nelson, with the Maniacal Scientist (Aubree Liss)Gulliver’s Travels. A crowd of 172 people attended the two performances of Gulliver’s Travels, written and conceived by Michael McGill, at the Boone Central High School Gym last Saturday. 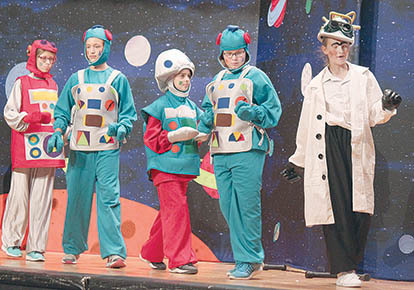 More than 30 children from grades K-12 were involved in the production. Gulliver traveled to different worlds – Brobdingnag, Lupunta, Lilliput, and Houyhnhnm – where he met many different characters who were coping with different problems. With the aid of the “Invisible Force,” Gulliver was able to bring peace between the Aliens of Lilliput and the Aliens of Blefuscu, and help the robots teach the Yahoos, who were unable to attend school. In the end, the characters learned the lessons of setting their differences aside and the importance of learning.